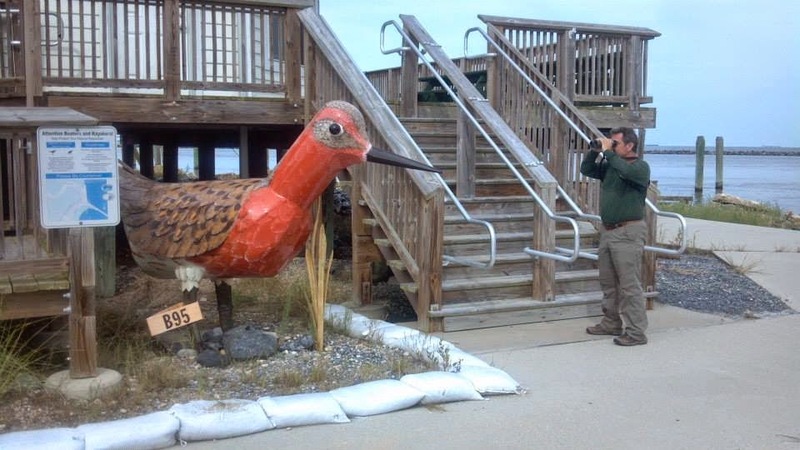 Shorebird migration: good news on Red Knots at Brig? The lives of us Hidden New Jerseyans get complicated this time of year. There are always festivals, great events at historic sites and more opportunities for us to make friends within the conservation community. And spring migration gives us limited chances to see birds decked out in their finest plumage on their way to their mating territory. Even the birds that raise families in New Jersey get frustratingly hard to see as they settle down and build nests in trees whose branches have suddenly become so leafy they obscure anything within. via the Delaware Bayshore for 20 years (and we hope still is!). And then, there are the Red Knots. You might remember them from our story last year. They're the endangered shorebirds that make a pit stop on the Delaware Bayshore enroute from their winter homes in Argentina and Chile to their summer breeding grounds in Arctic Canada. The window to see them is pretty darned small: generally a few weeks or less in May and June, after the horseshoe crabs have come out of the water to lay their eggs on the shore. Knots take advantage of that ever-reliable cycle to fatten up before flying the final leg of their 9000+ mile journey. Similarly, scientists flock to the Bayshore in large numbers this time of year to assess the health of the Red Knot population and its potential for growth. The fate of the species and the horseshoe crab are obviously intertwined, and efforts to bolster the crab population will have a major impact on these amazing travelers. Given other obligations, we didn't have the luxury of journeying to the Bayshore on a May weekend, as much as we would have liked. And given that Memorial Day came so early this year, there was no way we were going to go as far south as the Cape May County peninsula. Instead, we took our chances with Forsythe NWR, a.k.a. Brig, figuring we'd be able to see at least some of the shorebirds we needed to bolster our year lists. Still, I was hoping that a Red Knot or two would be in the mix. Considering how many warblers we'd missed seeing in New Jersey this spring, it seemed the fates owed us a treat. As we started our drive along the eight-mile Wildlife Drive atop the impoundment berm, we noted that the tide was out, leaving broad expanses of mud between large islands of marsh grass. Normally conditions like that leave a lot to be desired; a bit more water would concentrate the birds into a smaller area of drier ground. As we scanned broad swaths of mud, we considered the possibility we'd have to do a second sweep a few hours later, once the tide had come in. Still, though, we were finding occasional groups of shorebirds as we drove further along. Small Sandpipers and the occasional Willets gave us hope that we'd at least see something on our first go 'round. Then we heard the ruckus. A pebbly expanse just past the grassy shoulder of the berm was alive with birds busily pecking in the dirt for their mid-morning meal. The noise was extreme as dozens of Ruddy Turnstones pecked and dug and, well, turned stones to search for their meal. A couple of sizeable horseshoe crab shells stood motionless nearby, sending the silent message that yes, in fact, there might just be some eggs there, fairly far from the oceanfront. This was a gathering well worth leaving the car to investigate. A Red Knot! Milling among the Turnstones, the sole bird of its kind plucked its way through the stones and sand for a good meal. While the Knot was a singleton, it looked rather healthy and plump, as if it might have been chowing down for a good couple of days. Forsythe isn't generally known as the place to go to see Red Knots, being on the Atlantic Coast rather than the Bayshore, but at least one decided to grace us with its presence. As we later discovered when checking in with the Conserve Wildlife folks who keep track of such things, this year's count of migrants to the Delaware Bayshore has been especially good. That got me thinking about how our Red Knot found his way to a beach within viewing distance of Atlantic City. It's always possible that this single individual got a little confused or misplaced from the flock that usually ends up farther south and west, but I'd personally like to think that he's the harbinger, maybe the trendy guy who thinks he discovered the next great place for migrating Red Knots to spend their brief but meaningful Jersey Shore vacation. Yes, I'll admit I'm anthropomorphizing, but we can always hope that these small but mighty shorebirds will become so abundant that they'll need to stretch out a bit when they visit here in future migrations. Would it be the worst thing for Red Knots to visit AC every once in a while? One of my favorite parts of exploring New Jersey is that there's always the chance of finding something extraordinarily cool in a spot you're not really expecting. Like the time we found a bamboo forest at Rutgers in New Brunswick. Or when we discovered a piece of Grover Cleveland's wedding cake at his birthplace in Caldwell. Or found a taxidermied specimen of the now-extinct Heath Hen at the Drake House in Plainfield. Usually, they're not the things you're initially looking for in the place you're visiting, but they become one of the dominant aspects of your memories of the place. I had a similar experience recently in Trenton. As part of my work with the Crossroads of the American Revolution National Heritage Area, I'm at the Old Barracks several times a month. Said by some to be the last remaining colonial British military barracks in North America, it was constructed in 1758 as part of a larger defensive system during the French and Indian War. 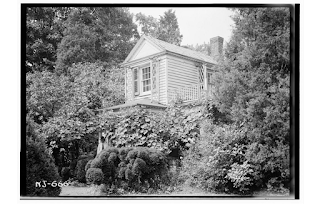 It played a pivotal role in the American Revolution and had a checkered past until it was purchased by local preservationists in the early 1900s. Now owned by the state of New Jersey, it's been fully restored to tell stories of colonial life and defense. If you're into military history or early Jerseyana, it's an amazing place to visit. 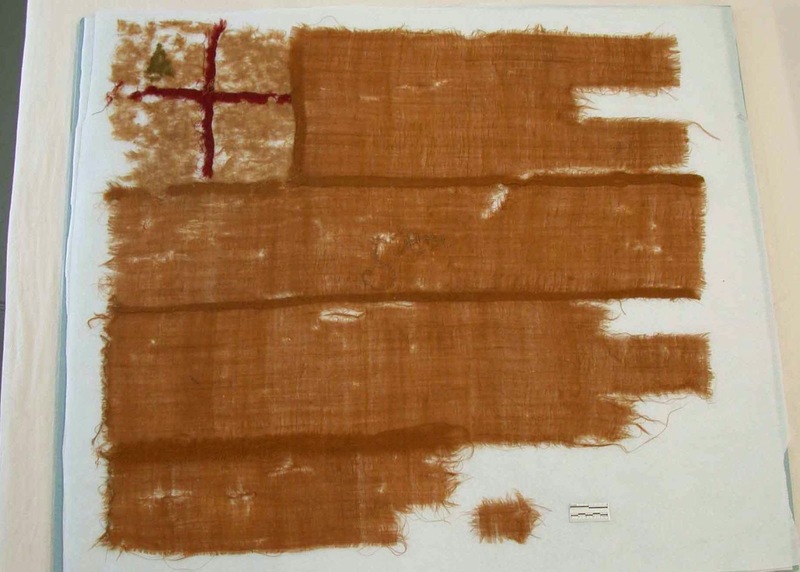 Among the many artifacts is something you'd never expect to find at a small museum in New Jersey: one of the oldest surviving flags in North America and maybe the British Isles. It's hanging unassumingly on a wall in the Barracks' French and Indian War exhibit space. The Pine Tree Flag. Photo courtesy The Old Barracks Museum..
How do artifacts like this survive, and how do they end up in Trenton? This one seems to have been the beneficiary of the forgetfulness of the soldier who might have been its creator. Flagbearer and Ensign Jacob Woodward took the homemade flag when his service was complete, tucking it away in a chest, much as many of us do when we move from one stage of our lives to the next. Maybe he took it out occasionally to view it, maybe not. All we know is that 200 years later, a Woodward descendant sold the chest and its contents in an estate sale, leaving the new owner to discover what he fortunately recognized to be a treasure. Professional textile conservators have estimated that the flag dates to the mid-1700s, if not earlier. One thing led to another until, in 2009, the Pine Tree flag found a home within Trenton's own French and Indian War relic. Though the Barracks and the flag weren't acquainted in their primes, it's fitting they should be together now, much like centenarians who meet at the VFW and build a friendship based on similar wartime experiences. Together, they tell a story of pre-Independence American history that so many of us know so little about. Our birding excursions at Sandy Hook usually lead us close to the tip of the hook, where Fort Hancock's Nine Gun Battery and Battery Peck continue to molder, unrestored. 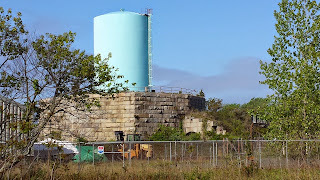 Part of the search for interesting species takes us close to the Coast Guard base, where, if you look in the right direction, you might notice an odd bit of construction: a very sturdy granite block structure topped by a water tank. The big stone walls seem like a bit of overkill to protect a water tank, both regal and like a discarded part of the set of Monty Python and The Holy Grail. Then again, they probably stood up well to the surges of Hurricane Sandy. It wasn't until recently that we noticed an additional, less medieval-looking wall coming out from one side and continuing eastward for a short bit, looking rather vestigial beneath overgrown vines. Ni! A portion of the old Fort at Sandy Hook. We did not bring it a shrubbery. 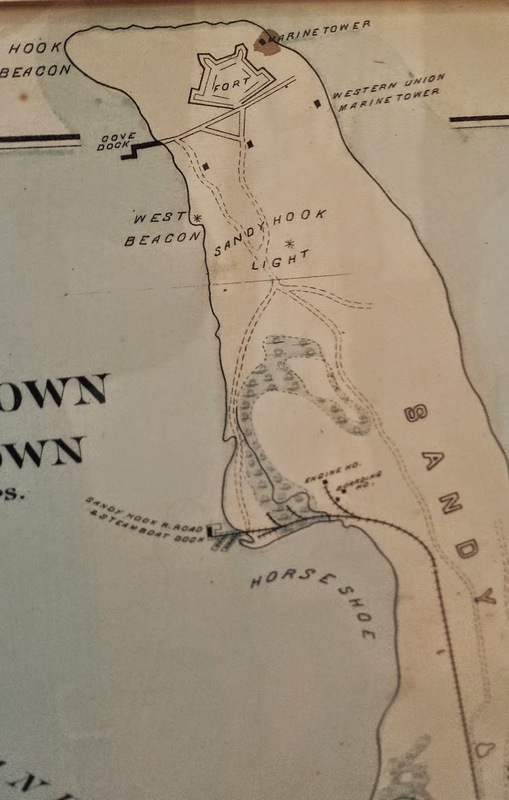 I didn't think much of it until my recent visit to the Strauss Museum in Atlantic Highlands (more on that to come), where I came upon a 19th century map of Sandy Hook. Rather than illustrating the location of Fort Hancock's many batteries and functional buildings, the map portrayed a pentagonal structure at the tip of the hook, labeled only as "fort." Part of the location matches the site of the still-standing walls. After a little research, I realized we'd inadvertently stumbled on the remnants of the Fort at Sandy Hook, the Civil War-era predecessor to the army base that had operated from the late 1800s until 1974.
near the top of this 19th century map. Who knew? 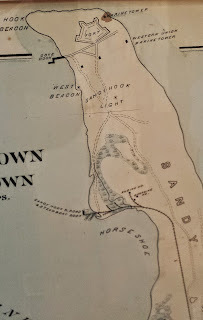 Sandy Hook's strategic location near the entrance to New York Bay makes it a perfect defense location, so it's not surprising that Fort Hancock wasn't the first Army base there. To start the tradition, the wooden-walled Fort Gates was built there in 1813 to protect the harbor and city. The rather obviously-named Fort at Sandy Hook was part of the next generation Third System U.S. fortifications as advances in weapons technology drove construction of granite-walled defense systems. Construction began on the hook in 1857 as part of a larger network of forts within New York Harbor that was designed to protect shipping channels into the city along with Forts Richmond (now Battery Weed), Tompkins, Hamilton and Lafayette near the Verrazano Narrows. As the map portrays, the fort's pentagonal shape was highlighted with bastions at each corner. Though construction was far from complete at the start of the Civil War, the Army outfitted the fort with more than 30 cannons of various sizes and capacities. Company E of the 10th New York Heavy Artillery was assigned to the fort in April 1863. By July 1866, the fort was vacant again, apparently never to be used again. Three years later and only 70 percent built, the Fort at Sandy Hook was declared obsolete. New artillery technology, in the form of rifled cannons, could easily destroy the granite-walled fortress, rendering it useless. However, portions of the fort were reportedly incorporated into the still-standing Nine Gun Battery built in the 1890s through the early 1900s. For safety reasons, Nine Gun remains closed to the casual visitor, so it's not easy (or prudent) to figure out exactly where the old fort walls exist in the newer construction. However, there's still that wall below the Coast Guard water tank, visible from Lot M at the base of the Fishermen's Trail near Battery Peck. Look carefully to the east of the tank, and you might be able to follow a line to additional parts of the fort wall. Don't attempt, however, to get too close. While the Coast Guard base is still recovering from Hurricane Sandy, the site remains an active military installation, and you can't just walk in. Even if you bring a shrubbery. Maybe it's a coincidence, but just as their baseball namesakes have come north to play the Mets and Yankees, Baltimore Orioles -- the winged ones -- have made their way to New Jersey. It's not entirely unusual - I generally see my first Baltimore Oriole of the year sometime in late April or early May. What's really getting me this year is the sheer numbers of them being reported in different areas around the state. I saw my first pair at the Deserted Village in Union County's Watchung Reservation over the weekend, typically the place where I find them for the year. I wasn't quite prepared for my next run in with a member of the species. My local neighborhood park -- a little common space in the midst of long-developed suburbia -- is home to an absurdly loyal series of Black-crowned Night Herons that has shown up every year, along with the usual small park coterie of sparrows, geese and Mourning Doves. Kingbirds and American Goldfinches will arrive from time to time, but Orioles? Never. Until the other day. Just about the time their human counterparts were probably starting batting practice at Citi Field, I heard a very fluid yet unfamiliar song as I was walking through the park. Who could it be? Fortunately I had my binoculars with me, making it substantially easier to scan the upper reaches of a large sycamore for whoever was vocalizing. And then... I spotted a bit of bright orange. Preferring the high perches as they do, Orioles, in my experience, at least, are far easier to identify from their color than from the black-and-white patterning of their wings or the darkness of their heads. That hue and the uniformity across the underside of the bird made the bird unmistakably a Baltimore Oriole. He hopped along a bit and gave me confirmation with a turn of his body. As I watched, I could see the bird singing his heart out. When he stopped, another Oriole within earshot began his vocalization. Could there be two in the neighborhood? And even more important, would they both find mates and build nests here? I haven't heard them since that evening, but I did find another in a park just a few miles away. Will he find a friend and make his summer home where I can visit easily? Will they raise offspring that will return next year and thrive as well? I can only hope they have better luck than the baseball team did with the Mets this week. County historical weekends are always reliable and often a scavenger hunt. They're reliable in that they all promise a bevy of local sites, many of them house museums where you can learn about life in a given town during the 1700s or 1800s. The houses are all wonderful in their own way, playing an important part in helping people appreciate local history. That said, there's only so many times you can hear about chamber pots and bed warmers before you start yearning for something a little different. That's where the scavenger hunt comes in. This past weekend, I checked out the Weekend in Old Monmouth, the two-day event encompassing more than 40 open sites on four separate driving routes in the county. Finding all of them would take a navigator or a GPS, and with Ivan on an out-of-state birding foray, I had neither. Thus, I picked a few spots and hoped for the best. Eventually, my strategy had me heading for the doctor's office. 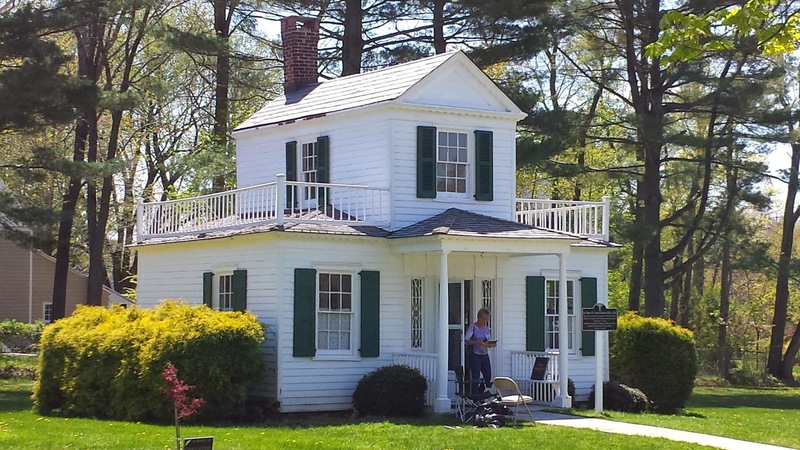 The Holmdel Historical Society contends that Dr. Robert Woodruff Cooke's office, built in 1823 or thereabouts, is the nation's first and oldest building used exclusively for a medical practice. In fact, they're so confident in the assertion that they're willing to give a cash reward to whoever can prove them wrong. Okay, the reward is only $25, but hey, they're willing to back up their claim. I was prepared for an old building when I drove up. What I wasn't expecting was how small it was. Boasting impressively detailed Federal-style architecture, the structure nonetheless looked more like a children's playhouse than a doctor's office. Indeed, when I walked in, I discovered that the entire first floor consists of a reception area, a smaller side room where examinations presumably took place, and a closet. 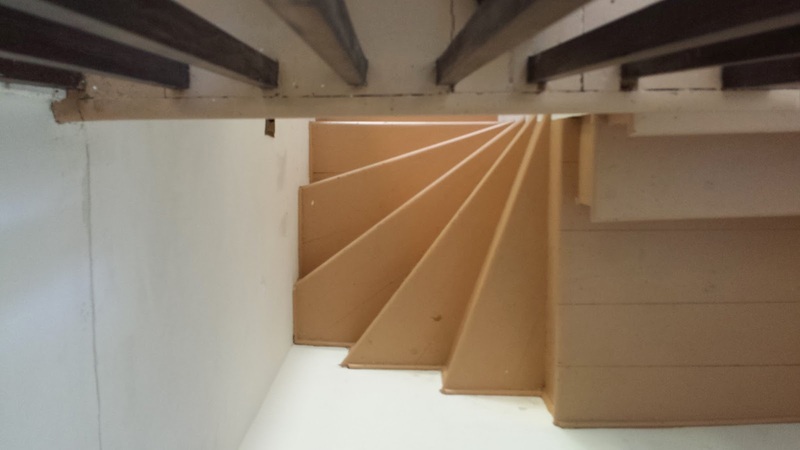 A door next to the fireplace opened to an extremely steep staircase leading to a second-floor bedroom that may have been used for overnight patients. How an ailing patient would be able to negotiate those steps was beyond me. A view from upstairs, over the railing and looking down. The second generation of his family to go into medicine, Dr. Cooke was born in Newton, grew up in Somerset County and attended medical school in New York. Ready to start his own practice after an internship with an older doctor, he purchased 14 acres of land in Holmdel in 1823 and built the office building. 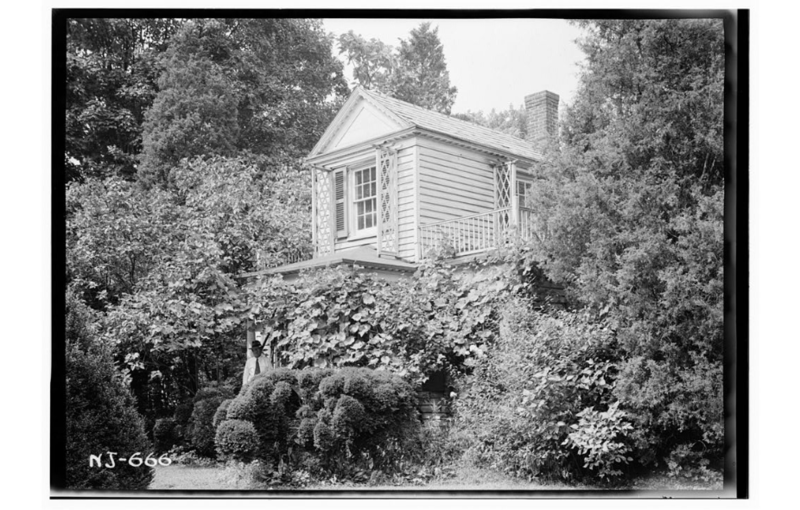 He later married and built an impressive house nearby for his growing family. As unique and interesting as the building and its history are, the real treat of the visit was talking with the members of the Holmdel Historical Society. Cooke family members have very kindly lent some of the doctors' medical instruments to help tell the story, and one of the docents almost gleefully explained their use (tonsil snipper, anyone?). Situated near the corner of McCampbell and Holmdel-Middletown Roads, the building was actually moved a few years ago to accommodate the construction of a McMansion development. It's now safe on the grounds of the Village Elementary School and listed on the New Jersey and National Registers of Historic Places, hopefully preserving its place in history permanently. Likewise, the historical society folks seem genuinely excited by this little gem they saved, and eager to discover more of its story. I had to wonder why Dr. Cooke had built a totally separate building for his practice, rather than designating a room or two in his house to see patients, as some doctors do today. Had he, perhaps, actually lived in the building before he got married? And had any of the building served as a de facto post office during the 19 years the elder doctor was Holmdel postmaster? The folks I met there had their own theories, but the facts are still to be proven. Like any great piece of local history, the story of Dr. Cooke's office continues to develop.